I am not the first person to discover this amazing swim hole. I am not the first of my friends to explore it. I am not even the one who thought up the idea to go on this particular day. I have friends that are much more awesome than I am. I just kinda hang on to their coat-tails and then take all the credit when I post pictures on social media or write about it on my blog. Yep, usually I'm just the follower of other people's great ideas. And for the most part, I'm ok with that. Since posting pics of Squaw Creek Swim Hole on my personal Facebook page, I have had several requests for directions to this amazing little gem out by Shasta Dam. So naturally I thought it would make for a great blog post. 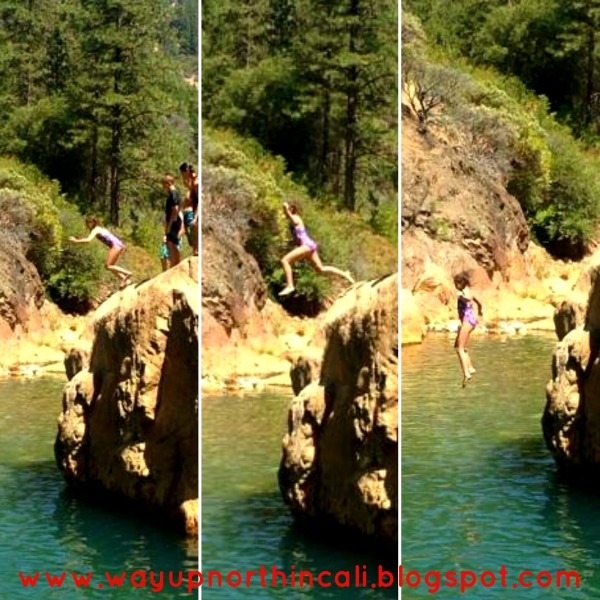 Video Credit: My much-more-brave-than-me-friend-who-encourages-her-kids-to-be-adventurous-and-doesn't-freak-out-when-they-jump-off-big-rocks, Megan. 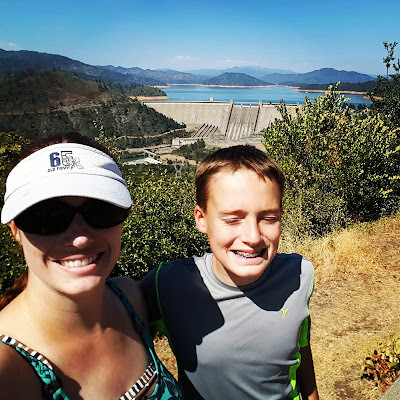 "Out to Shasta Dam. Just tell the guards you're going swimming. Drive across dam. Then left after the dam. Right on Westside Rd towards Dry Creek. Then on dirt road for 5 miles. Stay to the right at the fork. Just when you think you might be lost, there's a huge turnout for parking. If you go over the bridge, you just missed it. Hike down the trail. It's really beautiful and the water is clear and warm." Not so many years ago anyone could cross Shasta Dam any time of the day they wanted, in any type of vehicle, with anyone they chose. Then the horrible attacks of September 11, 2001 happened and that all changed. Suddenly people realized that we are vulnerable as a community if something happened to the dam. So it was closed. And for a while, you couldn't cross it at all. Then they finally settled on what we have now. Available crossings, with check points at both ends of the dam. Don't let the guards scare you from going over the bridge. They are all super friendly (I asked them for directions twice). But do be prepared to pull out your driver's license and let them peer in your back windows. My brave girl! I couldn't watch. Photo Credit goes to Michele who invited us to come and is my I-can't-watch-my-kids-jump-off-these-rocks-without-having-a-panic-attack partner. We are the same like that. That's me...trying not to freak out that I'm slipping down that rock. And down there with my two little ones is my bravest-and-coolest-of-all-mothers-who-jumps-off-rocks-with-her-children friend, Becky. 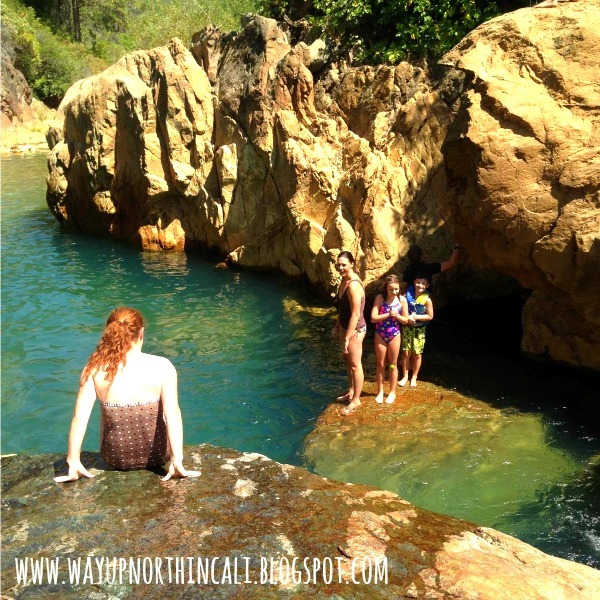 We will definitely be back to this amazing swim spot! It will be over 90 degrees for the next month, so let's go! I live on the west side of Redding and it takes just under an hour to get to the swim hole. You can park after the bridge and hike down to the top of the swim hole from the road. But that's the hard way. However there is a sweet little water hole to sit in up there. Some of the rocks are really slippery. Wear an athletic/hiking sandal or water shoes. Mothers that are easily freaked out by somewhat dangerous adventures, might think twice about going if you have people in your group that will jump off of high places into water. Disclaimer number two: Swim and jump off all the things at your own risk. There are rocks to jump off, but be careful people. Check for clearance, don't swim alone, etc. Be smart. Don't forget to take a dam selfie on your way out! 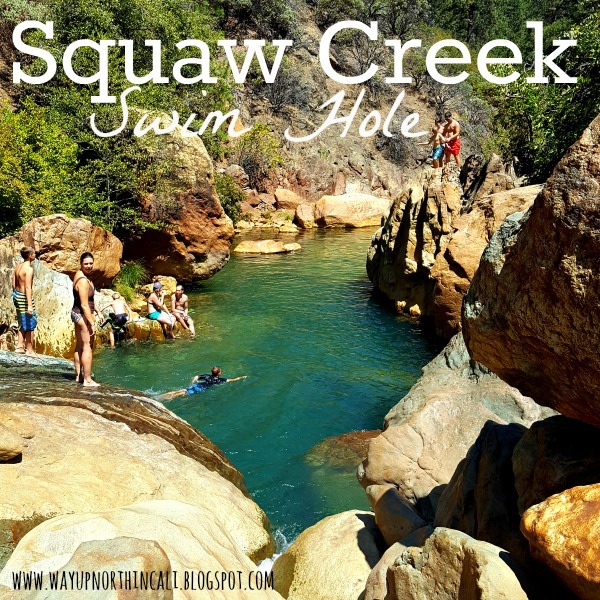 Have you been to Squaw Creek Swim Hole? What did you think? Leave a comment below. The past few weeks so many people have been going out there. The guy at the dam check point said, "That place is getting popular. Lots of minivans." Haha! !